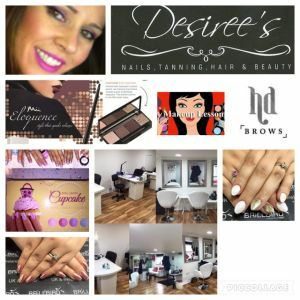 Welcome to Desiree’s beauty, hair and nail salon in the heart of Kirkintilloch. 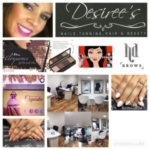 The salon is owned and run by Desiree and her team of professional therapists offering a fabulous one stop shop for glamour and beauty, hair styling and hair extensions, nails, brows and lashes, pamper packages for weddings and proms to booking in for make up with the resident make up artist for your night out or even a make lesson or two. An official and registered salon for top brands including Cinderella Hair Extensions, HD Brows, BrillBird UV gel and acrylic nail enhancements, Jessica Nail system, Fake Bake tan, Mii cosmetics. Nails, Manicures & Pedicures: BrillBird UV gel and acrylic nail enhancements, Jessica Geleration, Jessica pedicures, Bio Sculpture, Minx for toes, Swarovski Crystals, glitters, nails for brides. Lashes, HD Brows, Celeb Brows: Glam lashes, semi permanent lash extensions, party lashes, strip lashes, individual lashes, Official stockist of Dream weave mascara. party & proms updos, colour, hair extensions, #nailart, beauty & tanning, party glamour, dance make up, waxing to vajazzle, little princess parties to wedding packages and makeup. The salon shop: stocks a host of beauty and hair products to buy including Dreamweave Mascara, Sleep Rollers, Lip Voltage and Glitter Lips (as seen on Dragons Den Aug 2016) all to compliment your look. Take a look around, call or pop in and book your look.